The Sylvanian Families live in the idyllic world of Sylvania and encourage traditional family life play incorporating houses, furniture, accessories and memorable characters all with incredible detail that you'll love. Welcome to the Delicious Restaurant which serves the finest food in the Sylvanian Town. This beautifully designed building has a spiral staircase, colourful awnings and a whole host of furniture and accessories – even an outfit for your executive chef to wear! The kitchen furniture and pans are decorated with a beautiful rose motif, and just wait until you see what’s on the dessert trolley! This new bistro is the perfect place to end your day in town, or stop off for a restorative lunch during your busy day out shopping. Why not come on in and check out the menu? 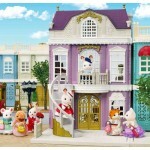 The Sylvanian Families live in the idyllic world of Sylvania and encourage traditional family ..